The new Ramadan drama “Haret al-Yahud” “The Jewish Quarter” has succeeded in getting Egyptians, across religions, to agree: The show is rather mediocre. The plot— a Muslim-Jewish love story set in 1948—could have been presented in a 90-minute film, but was instead dragged out into a 20-hour-long television series. The program’s glaring flaws, from the contrast between obviously-glued-on facial hair and an astronomical budget accommodating A-list actors to the historic inaccuracies of a plot written by people who assumed endless naiveté on the part of their viewers, have been meticulously shredded on social media and in the online press following each episode. A regular column on daily Al-Masry Al-Youm’s website, for example, has taken it upon itself to mockingly dissect every episode on account of both mediocrity and inaccuracy. There are anachronisms galore. A vendor peddles a Paco Rabanne perfume, which would not exist for another twenty years, and Jewish settlers in Palestine dance to a rendition of “Hava Nagila” recorded in 2011. The show provides endless entertainment for anyone with internet access and a penchant for fact-checking. 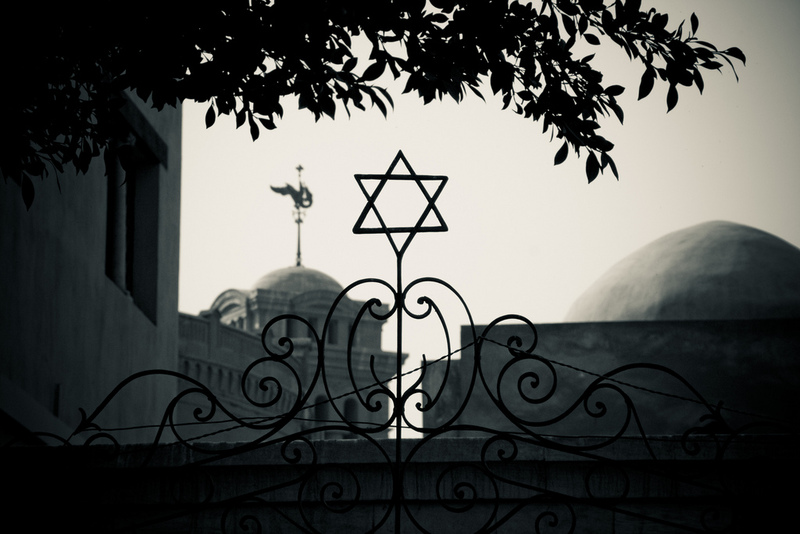 Even the head of the Egyptian Jewish community, Magda Haroun posted a brief public Facebook comment after the first episode, pointing out errors as early as the opening scene. Despite what is shown in the series, Torah scrolls in synagogues are not displayed on the altar, buildings in the Jewish quarter never had such beautiful and spacious entrances, and most homes in Cairo’s Jewish quarter did not have refrigerators. But the most extensive take-down of the series came from a pair of interviews with Albert Arie, one of the oldest Egyptian Jews still residing in Cairo, who explained that the actual lives of Jews who lived in the Jewish quarter hardly resembled what is depicted in the show. Largely poor and living in working-class squalor, they did not inhabit lavishly furnished apartments, did not dress so fashionably, and Jewish women certainly did not date Muslim army officers. The show’s creators seemed to have based their disinterest in airing the facts on the hope that most Egyptian viewers may have forgotten what it was like to have Jewish neighbors and know nothing about the Egyptian Jewish community today. Even if that were true, they have disregarded viewers’ access to resources that provide for immediate fact-checking and extensive daily rebuttals. But the writers also made another grave error. Even if most viewers know nothing about today’s Jews, they have been raised on a strict regimen of black-and-white films of the glory days of Egyptian cinema. Many of these films, dating back as early as the 1930s regularly featured Jewish actors, characters, and directors. Jewish characters in these movies–whether protagonists or supporting roles—had one feature in common: Even if they practiced Judaism, this was hardly ever presented as their defining trait. This is in stark contrast to the characters of “Haret al-Yahud,” who, despite peppering their conversations with the same old-timey expressions reminiscent of that golden cinematographic era, seem to solely discuss religion or nationalism with one another. Take the films of the Jewish Egyptian actor Shalom . As early as the 1930s, Shalom had developed a series of comedy movies where he played a character named after himself, with titles like “Shalom the Sportsman” (1936) and “Shalom the Translator” (1938). In these films, Shalom, playing an eponymous character, was always a deeply impoverished man, trying to make ends meet. Never, despite his Hebrew name, did the character of Shalom focus on the religious facet of his personality. Religion was occasionally brought forward in some films for comedic purposes. “Fatma, Marika and Rachel” (1949) delves partially into community stereotypes, with the beau attempting to seduce all three characters by pretending to be, at different times, Jewish, Christian, and Muslim. In “Hassan, Morcos, and Cohen” (1956), a few stereotypical religious quips are part of an exposition that sets up the film’s plot, which tells of a trio’s attempts to embezzle a rich colleague. “Laabat al-Sett” (“The Lady’s Puppet”, 1946), one of Egypt’s most beloved films, featured one of the most memorable Jewish characters ever portrayed, not only for the quality of Suleiman Naguib‘s acting, but more so because it was a rare instance of international politics bringing a character’s Judaism to the forefront, if only for a single scene. Naguib plays the protagonist’s employer, Isaac Anbar, a store owner who flees the approach of the Nazi armies to South Africa and leaves his business to the protagonist, thus allowing him to come into wealth. Throughout the film, however, nothing else is made of his religion; he is simply the protagonist’s employer. The contrived politicization of the Jews of “Haret al-Yahud,” only contributes to the alienation of its viewers, as it contradicts the image they have inherited of Egypt’s Jews. Ultimately, though, this series is not, as the title suggests, about the Jews of the Quarter. Beyond the inaccurate depiction, the show of Egypt’s Jews is a now all-too-familiar story of a glorified nationalist army and a vilified Muslim Brotherhood, led by an unconvincing Hassan al-Banna (with more glued-on facial hair). The makers of the series seemed to hope to impart their political message on the sidelines of this love story, once again underestimating their viewers. To its credit, the series did introduce viewers to some genuine aspects of Jewish life such as prayer in a synagogue, a chuppah at a wedding, and a rabbi conducting a ritual slaughter in a market. As contrived and occasionally imprecise as these scenes may be, it is laudable that they were featured matter-of-factly as facets of everyday life. This is the show’s only saving grace. But if the show wanted to truly portray the life of Egyptian Jews and their angst during some of the nation’s most difficult times, they would have done better to adapt one of the many autobiographies of Egyptian Jews who, in their writings, beautifully depicted the events of this period from a first-person perspective, such as Andre Aciman’s Out of Egypt or Lucette Lagnado’s The Man in the White Sharkskin Suit.” Both books, incidentally, are available in Egypt; the latter has even been translated into Arabic. Taking such works into account, however, would have compelled the series’ creators to address the role of the state in the exodus of Egypt’s Jews (which primarily took place after 1956 under Gamal Abdel Nasser, rather than in 1948 as the series suggests), complete with threatening, midnight phone calls from the political police to Jewish families; discriminatory citizenship laws, and one-way exit visas. “Haret al-Yahud” is, with all its shortcomings, less of a disaster than I had first predicted. It is nonetheless a missed opportunity which unforgivably underestimates its viewers, and the power of internet fact-checking. But we live in a time where truth is secondary to political messaging, even in television soap operas.